Faith Leaders Consultation held in Belize“As a leader in the Christian community our task is not only to prepare people for heaven but provide them with a model for living a life here and now” – Key Note Speaker. Thursday, 10 May, 2018 (PANCAP Coordinating Unit, CARICOM Secretariat): The Pan-Caribbean Partnership against HIV and AIDS (PANCAP), the mechanism that provides a structured and unified approach to the Caribbean’s response to the HIV epidemic, collaborated with National HIV/AIDS Commission to convene National Faith Leaders consultation in Belize on 10 May 2018 in Belize City, Belize. The consultation is funded by the CARIFORUM 10th European Development Fund Programme of Support for Wider Caribbean. 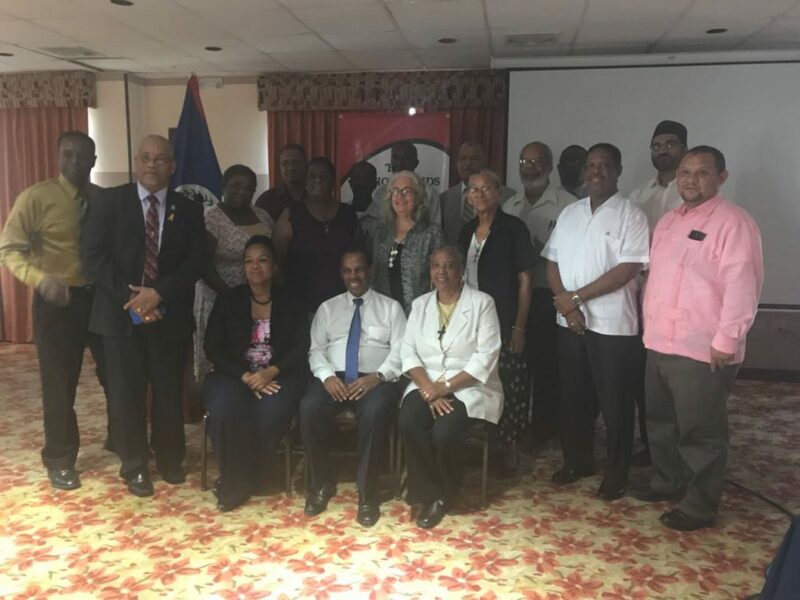 The aim of the consultation is to establish main goals for an inter-religious faith leaders network in Belize with emphasis on contributing towards the end of AIDS. This meeting follows a series of regional meetings involving faith leaders. In welcoming participants Hon. Laura Longsworth, OBE, Speaker of the House of Representatives and Chair of the National HIV/AIDS Commission, acknowledged the assistance and support of Faith Leaders and other partners that have helped to sustain the efforts to end the AIDS epidemic; Mrs. Longsworth observed that faith leaders are key to the response because they believe in the intrinsic value of human beings and noted that faith leaders promote access to services with love and humanity. In his opening statement Chair of the meeting, Bishop Roosevelt Papouloute noted that as human beings, faith leaders are challenged by the development in families and society. He lauded PANCAP for its leadership in advancing the Justice for All Programme and for recognizing the importance of the Faith leadership in accelerating the response to end AIDS by 2020. Bishop Michael Perreira, Senior Pastor of the Eccles Assemblies of God Church Guyana in delivering the keynote address acknowledged the value of networking with other stakeholders to achieve the purpose of God in ending AIDS by 2030. He applauded PANCAP for providing a platform for engagement. He contended that “as a leader in the Christian community our task is not only to prepare people for heaven but provide them with a model for living a life here and now”. He urged that the Church should not be oblivious of the human condition and must not fail to protect social justice for everyone. “If the church cannot resolve to fight AIDS it is neglecting their duty; Religious organizations need to do more and be more consistent in spreading the words and work together to end AIDS”. Inform their views/concepts of persons of a different sexual orientation. He stated, “this is necessary because members of key populations are not inclined to take us (faith leaders) seriously, as they are convinced that we are not genuinely concerned about them”. Preach and practice Christian Godly principles: love and respect all human beings whom God loves, just as they are our own. Partner with other stakeholders giving loving, empathetic Godly support. Find common ground as stated in the Regional Faith Leaders Forum Declaration of February 2017. Director of PANCAP Dereck Springer provided the background to the national consultation in the context of the PANCAP Justice for All Programme and Roadmap. He reminded the consultation of the underlining principles of the JFA Roadmap: Enhancing family life and focusing on those in need; Increasing access to treatment and affordable medicines: PANCAP playing an important role in reducing the price of medicines; Reducing gender inequality including violence against women, girls, and adolescents; Promoting sexual and reproductive health and rights including age-appropriate sexual education; and Implementing legislative reform for modifying AIDS-related stigma and discrimination. Dr. Francis Morey, Deputy Director of Health, Ministry of Health, Belize provided a status report on the HIV epidemic in Belize and the current response. He highlighted the challenges to achieving viral suppression among people living with HIV. First Lady of Belize and Chair of the Spouses of Caribbean Leaders Action Network (SCLAN) Mrs. Kim Simplis Barrow identified the major issues addressed by the ‘Every Caribbean Women Every Caribbean Child’ (CARIWAC) initiative. In defining the role that faith leaders can play Mrs. Barrow noted that health and well-being could be advanced by increased collaboration between SCLAN and Faith Leaders. She called attention to the adolescent population that is being overlooked, noting that a considerable number of girls are giving birth under the age of 15 years, thereby perpetuating the cycle of poverty. She also called for engagement of men and boys in reducing inequality of women and girls. Faith leaders who attended the regional faith leaders’ dialogues reflected on the experiences that helped them to dispel their apprehensions, the role of the science in achieving the end of AIDS, barriers to access to health services and the need to foster continued transformation of the mind. Following deliberations in small groups, faith leaders identified the following challenges impacting faith leaders’ response including differences between religious principles and practices; creating refuge for those in need; lack of religious organizations’ input into the development of the sexual education curriculum; unified education and counselling; preparation for respectful dialogue when court rulings contradict religious doctrines; lack of concrete information; how to creatively utilize social media. Participants provided several proposals for addressing the challenges identified. These included education of the congregation; liaising with key stakeholders including National AIDS Programmes (NAP); establishing a structured approach such as hubs; identifying and sharing best practices from other Faith-based Organizations (FBOs) and Civil Society Organizations (CSOs); ensuring that faith leaders are relevant by utilizing social media; create spaces of refuge and places of acceptance; provide prevention services; sensitizing faith leaders about confidentiality; accept people where they are; uplift the community; encourage people to know their status and in the case of couples share their results and offer positive alternatively ways of living. Faith leaders also recommended the promotion of the following programmes and policies within individual religious groups and national inter-religious networks: structured approach that is focused on helping people; development and implementation of youth education programmes utilizing creative methodologies such as edutainment and utilizing the mobile app developed by the National AIDS Commission (NAC), Belize to access information. Faith leaders agreed on the need for an inter-religious organization that brings together the various groupings around the HIV response and will meet shortly to formalize the process for moving forward. The Director of PANCAP pledged the Coordinating Unit’s support to the national network as it evolves. Under the 10th (EDF) Programme of Support for Wider Caribbean Cooperation, PANCAP will strengthen coordination on human rights issues in keeping with the Justice For all Roadmap through the HIV and AIDS Thematic Task Force in CARIFORUM. CARIFORUM refers to the Grouping of Caribbean States which are signatories of the Georgetown Agreement establishing the African, Caribbean and Pacific Group of States (ACP). The ACP grouping is composed of 79 African, Caribbean and Pacific states. CARIFORUM is the recipient of and manages the implementation of Caribbean Regional Indicative Programmes financed by the EDF and Caribbean regional programmes financed by individual Member States of the European Union. It also provides technical assistance to agencies/institutions implementing projects under these programmes. The Member States of the European Union have decided to link together their know-how, resources and destinies. Together, they have built a zone of stability, democracy and sustainable development whilst maintaining cultural diversity, tolerance and individual freedoms. The European Union is committed to sharing its achievements and its values with countries and peoples beyond its borders’.